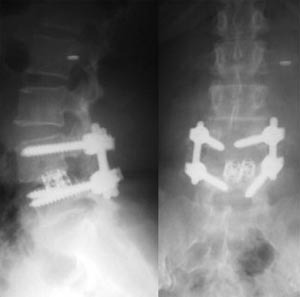 Spinal Fusion is a surgical technique in which one or more of the vertebrae of the spine are united together (“fused”) so that no motion occurs between them. Generally some type of spinal implants are used. they are made up of titanium alloy. 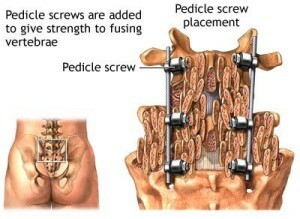 These implants are inserted in to the spinal bone in order to help fusion. Also, some bone grafts are placed around the implants during surgery. The body then heals the grafts over several months – similar to healing a fracture. Sometimes a hairline fracture allows one vertebra to slip forward on another. This condition is called spondylolisthesis (see page on Spondylolysis and Spondylolisthesis) and can be treated by fusion surgery. Another condition that is treated by fusion surgery is actual or potential instability. Instability refers to abnormal or excessive motion between two or more vertebrae. It is commonly believed that instability can either be a source of back or neck pain or cause potential irritation or damage to adjacent nerves. Although there is some disagreement on the precise definition of instability, many surgeons agree that definite instability of one or more segments of the spine is an indication for fusion. Cervical disc herniations that require surgery usually need not only removal of the herniated disc (discectomy), but also fusion. With this procedure, the disc is removed through an incision in the front of the neck (anteriorly) and a small piece of bone is inserted in place of the disc. Although disc removal for a disc hernation is commonly combined with fusion in the neck, this is not generally true in lumbar disc herniations. Spinal fusion is sometimes considered in the treatment of a painful spinal condition without clear instability. A major obstacle to the successful treatment of spine pain by fusion is the difficulty in accurately identifying the source of a patient’s pain. The theory is that pain can originate from painful spinal motion and fusing the vertebrae together to eliminate the motion will get rid of the pain. Unfortunately, current techniques to precisely identify which of the many structures in the spine could be the source of a patient’s back or neck pain are not perfect. Because it can be so hard to locate the source of pain, treatment of back or neck pain alone by spinal fusion is somewhat controversial. Fusion under these conditions is usually viewed as a last resort and should be considered only after other conservative (nonsurgical) measures have failed. There are many surgical approaches and methods available to fuse the spine, and they all involve placement of a bone graft between the vertebrae. The spine may be approached and the graft placed either from the back (posterior approach), from the front (anterior approach) or by a combination of both. In the neck, the anterior approach is more common; lumbar and thoracic fusion is more commonly performed posteriorly. The ultimate goal of fusion is to obtain a solid union between two or more vertebrae. Fusion may or may not involve use of supplemental hardware (instrumentation) such as plates, screws and cages. Instrumentation is sometimes used to correct a deformity, but usually is used as an internal splint to hold the vertebrae together to while the bone grafts heal. Whether or not hardware is used, it is important that bone or bone substitutes be used to get the vertebrae to fuse together. The bone may be taken either from another bone in the patient (autograft) or from a bone bank (allograft). Fusion using bone taken from the patient has a long history of use and results in predictable healing. Autograft is currently the “gold standard” source of bone for a fusion. The iliac crest is a common donor site for autograft. Allograft (bone bank) bone may be used as an alternative to the patient’s own bone. Although healing and fusion is not as predictable as with the patient’s own bone, allograft does not require a separate incision to take the patient’s own bone for grafting, and therefore is associated with less pain. Smoking, medications you are taking for other conditions, and your overall health can affect the rate of healing and fusion, too. Currently, there is promising research being done involving the use of synthetic bone as a substitute for either autograft or allograft. It is likely that synthetic bone substitutes will eventually replace the routine use of autograft or allograft bone. 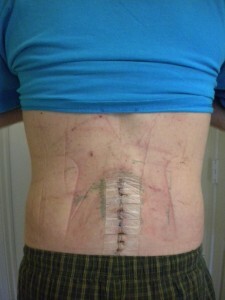 With some of the newer “minimally invasive” surgical techniques currently available, fusion may sometimes be done through smaller incisions. The indications for minimally invasive surgery (MIS) are identical to those for traditional large incision surgery; however, it is important to realize that a smaller incision does not necessarily mean less risk involved in the surgery. How Long Will it Take to Recover from Fusion Surgery? It also takes longer to return to a normal active lifestyle after spinal fusion than many other types of surgery. This is because you must wait until your surgeon sees evidence of bone healing. The fusion process varies in each patient as the body heals and incorporates the bone graft to solidly fuse the vertebrae together. The healing process after fusion surgery is very similar to that after a bone fracture. In general, the earliest evidence of bone healing is not apparent on X-ray until at least six weeks following surgery. During this time, the patient’s activity is generally restricted. Substantial bone healing does not usually take place until three or four months after surgery. At that time activities may be increased, although continued evidence of bone healing and remodeling may continue for up to a year after surgery. The length of time required you must be off of work will depend upon both the type of surgery and the kind of job you have. It can vary anywhere from approximately four to six weeks for a single level fusion in a young, healthy patient with a sedentary job to as much as four to six months for more extensive surgery in an older patient with a more physically demanding occupation. In addition to some restrictions in activity, a brace is sometimes used for the early postoperative period. There are many types of braces available. Some are very restrictive and are designed to severely limit motion, while others are intended mainly for comfort and to provide some support. The decision to use a brace or not, and the optimal type of brace, depends upon your surgeon’s preference and other factors related to your surgery. Following spinal fusion surgery, a postoperative rehabilitation program may be recommended by your surgeon. The rehabilitation program may include back strengthening exercises and possibly a cardiovascular (aerobic) conditioning program. In some cases, a comprehensive program will be custom-designed to safely get the patient back to work. The decision to proceed with a postoperative rehabilitation program depends upon many factors. These include factors related to the surgery (such as the type and extent of the surgery) as well as factors related to the patient (age, health and anticipated activity level.) Active rehabilitation may begin as early as four weeks postoperatively for a young patient with a single level fusion.